Arnold Law, LLC: Six Degrees of Separation. The promise of the new administration to crack down on illegal immigration is well under way. So many of us know someone who knows someone who is challenged by being an illegal immigrant in this country. For those that feel the pressure everyday life is challenging. They go to and from work and do not draw any attention to themselves. There are people in this great land who want to own a car, take a vacation, or purchase a home, but cannot at this point. There is concern about family, friends, and neighbors in their community as they work toward getting the proper documentation. No one should have to live this way! 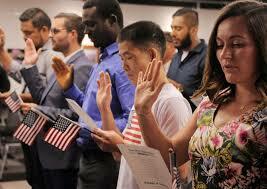 The answer, of course is becoming a legal American citizen before the dream is dashed. In the Baltimore area the right person to contact NOW is Briana Arnold. She is a Baltimore area legal documentation lawyer. She will assist you and your family on this important journey so you can walk around with your head held high. Call her today at (410) 484-1400.